Some people, especially elderly are exposed to difficult health problem; one of them is feet swelling in an abnormal way, causing them difficulty in wearing shoes or movement and walking in general. This problem occurs to both men and women alike, and is often a sign of other serious health problems. It not are a disease itself, but another display of a disease that does not appear easily and need a specialist to perform certain tests to detect it. 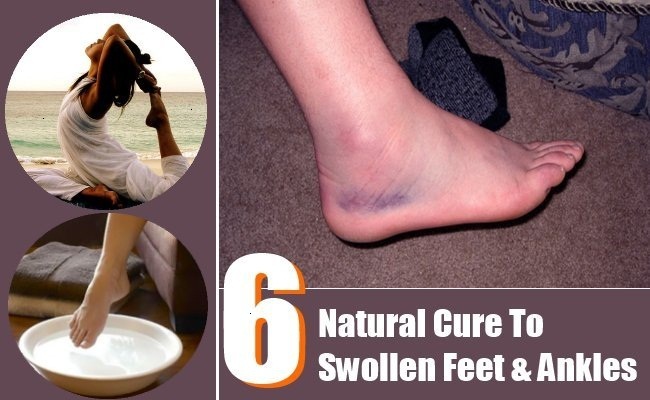 We are here today to offer you some tips and remedies that will help treat feet swelling. This type of water therapy includes both cold and hot water, which is highly effective in reducing the swelling of the feet. The warm water helps improve blood circulation while the cold water helps reduce swelling and inflammation. Fill tow containers, one warm and the other cold water with water, Soak your feet in warm water for 3 or 4 minutes, then put them in cold water for one-minute duration, Continue the process alternating between the cold and warm water for 15 or 20 minutes. Be consistent with this method and do it and you will notice the result. Foot massage is one of the best remedies for swollen feet, it helps relax painful muscles and improve blood circulation. All you have to so is rub some ot mustard oil or olive oil on the affected area, and message gently for 5 minutes in an upward direction, Avoid excessive pressure and use this method daily. Note: If the swelling in the feet due to pregnancy, you should consult a massage specialist. Salt is a fast treatment to reduce swelling and can help to relieve pain as well as improve blood circulation, mix half a cup of salt in a bathtub filled with warm water, and soak your feet for 10 or 15 minutes, use this remedy three times a week. Ginger is a natural diuretic, which helps in the treatment of swollen feet, it also helps to reduce sodium, which the main factor behind the swelling, in addition, and it contains anti-inflammatory that helps reduce swelling. Massage your feet with ginger oil several times a day, and you can also drink 2-3 cups of ginger tea or chew some raw ginger slices. Apple cider vinegar also helps relieve swelling of the feet, because it contains a high content of potassium and helps reduce fluid retention, which is a common cause of swelling in the feet. Mix equal amounts of warm vinegar apple water, Soak the towel in this mixture, and cover the feet for 10 minutes, use this treatment several times a day. Regular physical exercise are important for preventing swelling in your feet, they also stimulate blood circulation, swimming is one of the best exercises you can do to reduce swelling and relieve inflammation and pain, walking or jogging for 30 minutes five days a week is very important for those who suffer from the problem bloating.